Faculty Spotlight – Sharon Simmons, Ph.D. Entrepreneurship has been a part of Sharon Simmons life for as long as she can remember. Simmons, who joined the Henry W. Bloch School of Management as an assistant professor of Global Entrepreneurship in August 2015, was born and raised in the U.S. Virgin Islands. Her parents owned and operated a restaurant for 35 years, and Simmons played a key role in the business. “From the time I was in middle school, I helped out with inventory, balanced the books and basically did my part to keep everything running smoothly,” Simmons said. Simmons received her J.D. and Masters in Accounting from the University of Virginia, a combination that allowed her to work as a professional services consultant for firms in a variety of industries. In her 10 years with Deloitte and PwC, Simmons had clients in the areas of real estate, manufacturing and retail, among others. 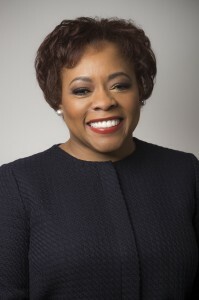 Though she spent years working in the for-profit sector, Simmons was always intrigued by the idea of working in academia, and received her Ph.D. in Entrepreneurship and Emerging Enterprises from Syracuse University in 2012. Simmons spent three years teaching entrepreneurship at William Patterson University in New Jersey before making the move to Kansas City. When she saw a chance to join the faculty at the Bloch School, she jumped at the opportunity. In addition to her teaching responsibilities, research has been a focus of Simmons’ since joining the Bloch team. Derived from her dissertation, much of Simmons’s current work concentrates on how different regulations and cultural attitudes affect entrepreneurs. She further hones in on experienced entrepreneurs, a part of the population she feels is frequently neglected in research. As she furthers her own research, Simmons hopes to have an impact on students looking to grow their professional resumes as well. Her connections with students don’t end at the Ph.D. level, though.